TC: Thank you very much, your highness King Willem-Alexander of the House of Orange, for inviting me to interview you during your Sunday morning breakfast. I hope that your highness has had a good night’s sleep and enjoys the excellent coffee as well as I do ? King: Well, thank you for interviewing me. Yes, I slept well, and my wife, Queen Maxima, too. Please note that I always mention her in interviews, not only to please her, but people tend to know me as “the husband of Queen Maxima”, so that it is useful to make clear that I really am who I am saying who I am. TC: Yes, I was going to ask about her too. Unfortunately she isn’t here for the interview, but I would like to compliment her with her presentation yesterday on occasion of 200 years of the Kingdom of the Netherlands. She was elegant as always but it struck me also how slender she looked. King: Elegant and slender. Yes, I can remember that. I will pass on the compliment. TC: I hate to spoil a good breakfast – did you try those sausages ? Oh, yes, you have this every morning – but, of those 200 years you have been king now for 1.5 years, and there has already been this MH17 disaster killing 283 passengers and 15 crew members, of which 193 Dutch people. One victim was senator Willem Witteveen, son of Johannes Witteveen who we once featured in this weblog with his important analysis on the economic crisis. Also Willem’s wife and daughter were in that plane. The elder Witteveen is devastated and will likely not speak in public anymore, which is sad for the economic discussion too. King: I suffer with all the families of the victims. I or a member of the Royal Family have been to all receptions of the planes that returned with the remains of the victims. The Dutch government is doing their best to support the families, identify the remains of the victims, and prosecute those who are responsible for this. TC: Do you hold Vladimir Putin accountable ? King: I am somewhat disappointed in the President of Russia. Last year November we met at a reception in the Kremlin for the Year of Dutch-Russian Friendship, and then this year in February at the Winter Games 2014 in Sochi we drank beer together. Besides, our vacation villa’s in Greece are at just walking or swimming distance. We try to be good friends and neighbours. If President Putin hadn’t supported those Russian rebels in the East then they would not have shot that plane. Putin could have exerted more influence to stop the fighting, so that our research team would have been better able to investigate the crash area. TC: But do you hold Vladimir Putin accountable ? King: I wished thing were that easy. The situation is complex. There is also the warring in the Middle East. TC: Yes – apart from that really delicious pancake and syrup – what are your thoughts about the Middle East ? All civilized people in the world feel that they are dragged into a medieval horror show. Where is the world leadership ? King: My impression is that history is repeating itself. The Roman Empire split up into the Eastern and Western parts, and those parts started fighting each other. General Belisarius of the Eastern Empire devasted Italy around 550 AD. When Islam came up around 600 AD, it started as a small sect, but because the Western Roman Empire had collapsed the relatively small Islamic tribes could conquer its domains in a mere 30 years. For us, when Europe and Russia are at loggerheads over the Ukraine, they forget about handling that “Islam State” that is filling the void in the Middle East. TC: An amazing historical parallel ! What will you do about this, as King of Holland ? King: I have decided that the House of Orange will claim the throne of Russia. As you know, my great-great-something-grandmother was Anna Pavlovna, so we are directly descendant from Czar Paul I of Russia. We had a family meeting and discussed the Russian problem of Putin. We observed that Russia never had a constitutional monarchy to make the common transition from feudal dictatorship to modern democracy. Hence it is sensible that a member of the House of Orange takes the throne there, and allows Russia to make the change. We will oversee that there are free democratic elections with a free press, and if Putin’s party loses, so be it. TC: Excuse me for goggling and gurgling, sire – I am somewhat choking on this great Russian Salad. But, recouperating: You are claiming the Romanov throne ? King: Ah, be careful here. First of all, the Romanov family is just a romantic relic. Prince Nikolai Romanovich is a good chap, but he is not a ruling king. Secondly, crownprince Charles of England has also good papers, but his eyes are on the English throne, just as prince William’s, while Andrew and Harry are too wild. Besides, the House of Hanover is much overrated. The House von Anhalt that produced Catherine the Great is too much of a good thing. History shows that the House of Orange is modest middle of the road, given that people still don’t know about the Dutch Empire. Thirdly, Maxima and I will remain in Holland, since it is much more difficult to manage a mature democracy like Holland. Besides, our vacation villa is close to Putin’s – well, I said that – and we want to remain good neighbours. Fourthly, my brother Constantijn is good in languages. 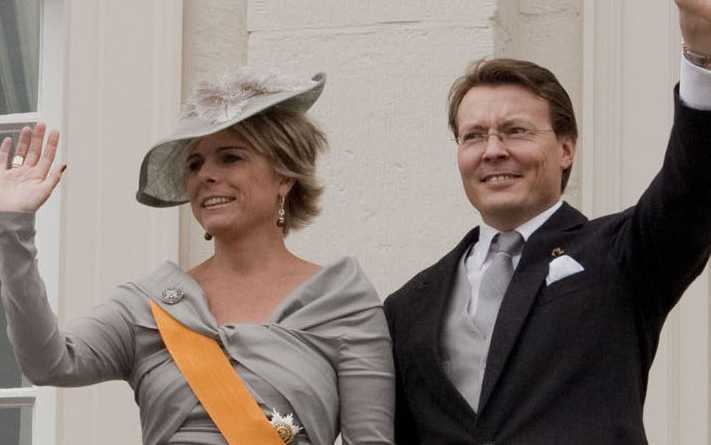 Thus Constantijn and Laurentien will take the throne of Russia. TC: Thank you very much, your highness, for this exquisite breakfast, that was very nourishing for both body and mind. I hope to hear soon about your ideas of how to realize this ambitious plan. Could you also give me Constantijn’s telephone number, for his view on this ? King: Just dial any number and ask for him. At least, that is how my phone works. You should try to get one like that.